Digital image via Cornell University Library. Native Americans of Fifth Ward. Philadelphia, 1844. Textiles Collection. This ribbon from the Textiles Collection in the Political Ephemera Collection documents a local political event organized by the Philadelphia Native American Party in 1844. Southwark incorporated into Philadelphia as the Fifth Ward—or so-called “Bloody Fifth”—later became infamous for Election Day riots between Irish immigrants, African Americans, and police. Henry Clay. Philadelphia, 1844. Textiles Collection. This political ribbon (also from the Textiles Collection) was illustrated with vignettes and text in support of 1844 Whig presidential nominee Henry Clay. In the election of 1844, Henry Clay ran on a platform that supported high tariffs and opposition to the annexation of Texas as a slave state. He was defeated by the pro-annexation Democratic nominee James Polk. Digital image via Library Company of Philadelphia. William and Frederick Langenheim. Northeast Corner of Third & Dock Street. Philadelphia, May 9, 1844. John A. McAllister Collection. While this daguerreotype cannot be classified as a political cartoon, it certainly is political imagery. 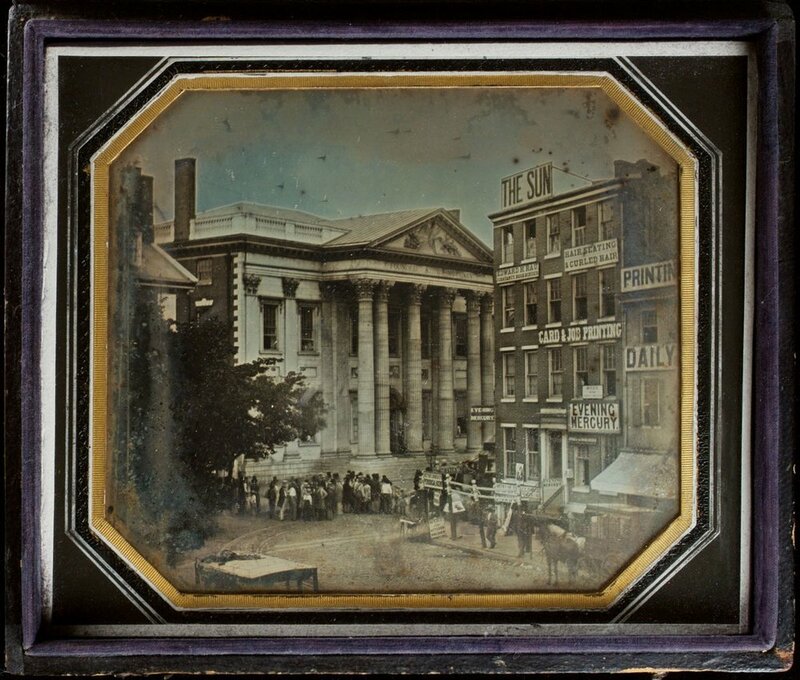 Captured by photographers and former newsmen William and Frederick Langenheim, this image is credited as both the earliest extant photograph of America’s oldest bank (the First Bank of the United States) and the earliest known Philadelphia “news” photograph. A day after the anti-Catholic Know-Nothing riots (May 9, 1844), the Langenheims captured the image from their studio in the Merchant’s Exchange. After rioters burned the churches of St. Michael and St. Augustine, the Pennsylvania militia declared martial law and seized Girard Bank as its headquarters. The Langenheims recorded this “news” photograph by shooting through a prism to prevent the reversal of the image. As newsmen, the Langenheims understood that the appeal of “news” would be disrupted if the spectator was distracted by visual inconsistencies (e.g. mirrored signs). The brothers continued to push the boundaries of photography. The next year, their panorama of Niagara Falls earned them international fame. In early-1850s, they patented lantern slides for slide-show entertainment (i.e. glass transparencies) and published the first stereographs in the United States. Digital image via Library of Congress. Nathaniel Currier. The Propagation Society—More Free than Welcome. New York, 1855. Political Cartoon Collection. 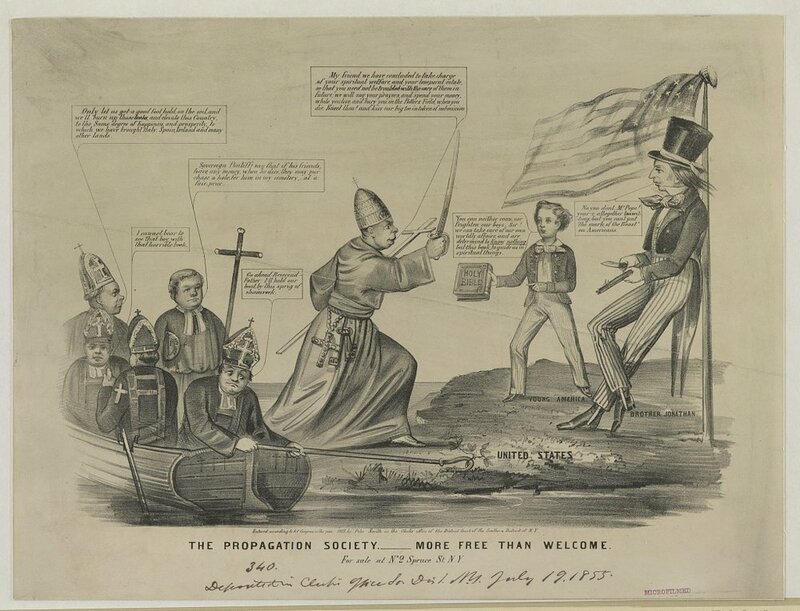 This anti-Catholic lithograph plays upon popular fears of Irish immigration and Catholic education. The title refers to the Society for the Propagation of the Faith, a Catholic proselytizing organization. On the shore labeled “United States,” Brother Jonathan leans against a flagpoles beside “Young America,” personified by the boy in striped trousers holding a Bible. Both figures face Pope Pius IX, who steps ashore from a boat. The latter holds a sword in one hand a cross in the other. Five bishops remain on the boat. The term Know Nothing alludes to the nativist political party. Nathaniel Currier. Grand National American Banner. New York, 1856. John A. McAllister Collection. John Magee. The Morning after the Election—November 1856. Philadelphia, 1856. Political Cartoon Collection.